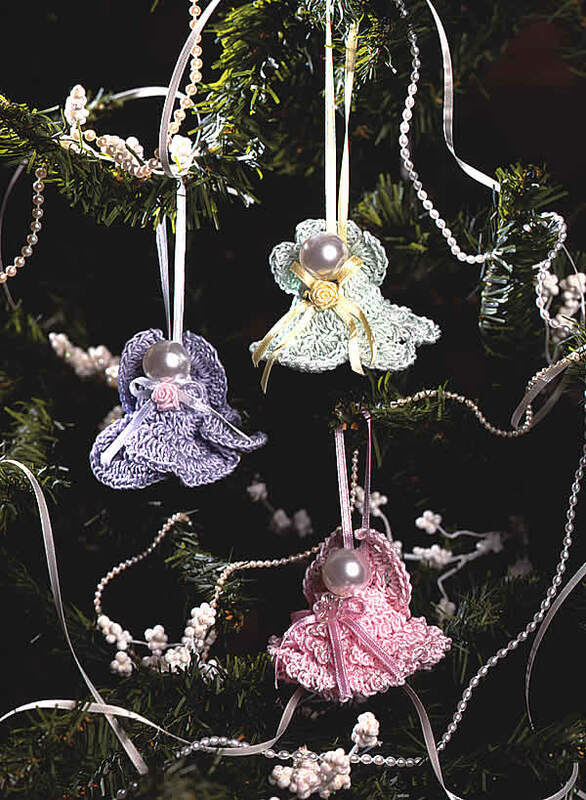 Get into the holiday spirit early with these beautiful angel ornaments to dress up your Christmas tree, adorn holiday packages or give as gifts. Enjoy! Pattern Notes Beg ch-3 counts as first dc of row or rnd unless otherwise stated. Join with sl st unless otherwise stated. Angel No. 1 Rnd 1: Ch 15, join in first ch to form ring, ch 3, dc in each rem ch around, join in 3rd ch of beg ch-3. (15 dc) Rnd 2: Working this rnd in back lps only, ch 3, dc in same st, 2 dc in each rem st around, join in 3rd ch of beg ch-3. (30 dc) Rnd 3: Working this rnd in back lps only, ch 3, 2 dc in next st, [dc in next st, 2 dc in next st] around, join in 3rd ch of beg ch-3. (45 dc) Rnd 4: Working this rnd in back lps only, [ch 3, sk next st, sc in next st] around, ch 3, join in first ch of beg ch-3. Rnd 5: Working this rnd in front lps of rnd 3, sc in first st, ch 3, [sc in next st, ch 3] around, join in beg sc, fasten off. Rnd 6: Working in front lps of rnd 1, join with sc in any st, ch 3, [sc in next st, ch 3] around, join in beg sc, fasten off. Rnd 7: Working in front lps of rnd 2, rep rnd 6. Wings Row 1: Ch 4, 11 dc in 4 th ch from hook (3 skipped chs count as first dc of row), turn. (12 dc) Row 2: Ch 1, sc in first st, [ch 3, sc in next st] across, turn. (11 ch-3 sps) Row 3: Sl st in next ch sp, ch 3, 4 dc in same sp, [sc in next ch sp, 5 dc in next ch sp] across to last 2 ch sps, sc in next ch sp, (4 dc, ch 3, sl st) in last ch sp, fasten off. Angel No. 2 Rnd 1: Ch 15, join in first ch to form ring, ch 3, dc in next ch, 2 dc in next ch, [dc in each of next 2 chs, 2 dc in next ch] around, join in 3rd ch of beg ch-3. (20 dc) Rnd 2: Ch 1, sc in first st, [*hdc in next st, 3 dc in next st, hdc in next st*, sc in next st] 4 times, rep bet * once, join in first sc. Rnd 3: Ch 1, sc in first st, [*hdc in next st, 2 dc in next st, 3 dc in next st, 2 dc in next st, hdc in next st*, sc in next st] 4 times, rep bet * once, join in first sc. Rnd 4: Ch 1, sc in first st, [3 dc in each of next 9 sts, sc in next st] 4 times, 3 dc in each rem st around, join in first sc, fasten off. Wings Row 1: Ch 4, 5 dc in 4th ch from hook (3 skipped chs count as first dc of row), turn, (6 dc) Row 2: Ch 3, 2 dc in same st, 3 dc in each of next 4 sts, ch 3, sc in same st as last dc, ch 3, sl st in same ch as 5 dc on row 1, do not turn. Row 3: Ch 3, 4 dc in same ch as last sl st, turn. Row 4: Ch 3, 2 dc in same st, 3 dc in each st across, ch 3, sc in same st as last dc, fasten off. Finishing Work same as Finishing for Angel No. 1. Angel No. 3 Rnd 1: Ch 18, join in first ch to form ring, ch 3, dc in each rem ch around, join in 3rd ch of beg ch-3. (18 dc) Rnd 2: Ch 3, dc in same st, 2 dc in each rem st around, join. (36 dc) Rnd 3: Ch 3, 6 dc in same st, [sk next 2 sts, sc in next st, sk next 2 sts, 7 dc in next st] 5 times, sk next 2 sts, sc in next st, sk next 2 sts, join. Rnd 4: Sl st in each of next 3 sts, ch 3, 8 dc in same st as last sl st, hdc in next sc, [9 dc in center st of next 7-dc group, hdc in next sc] around, join, fasten off. Wings Row 1: Ch 5, 6 dc in 4th ch from hook (3 skipped chs counts as first dc of row), 5 sc in last ch; working on opposite side of beg ch, (6 dc, ch 3, sc) in same ch as last 6 dc, turn. Row 2: Sl st in each of next 3 chs, sl st in each of next 3 dc, ch 3, 8 dc in same st, sk next 3 dc, sc in each of next 2 sc, 3 sc in next sc, sc in each of next 2 sc, sk next 3 dc, (8 dc, ch 3, sc) in next dc, leaving rem sts unworked, fasten off. Copyright © January 1995 Crochet Home, an Annie’s publication. All Rights Reserved. Love working with crochet cotton! These are adorable. Thank you for sharing the pattern. Thank you for sharing your pattern. These are so beautiful, and may I say angelic? They look so cute. Thanks for the share! Thank you so very much! I can not state in words how much I appreciate the patterns! You are so kind to do this for us all!!! I will try this, would love to put these on gifts. Will let you know how they turned out. Thank you for pattern. These are so cute. I will be making some. Thank you so much for sharing the pattern. Where can I get the 38mm white metal bell with hole in handle, and do you have picture of the bell. A regular jingle bell will work just fine! What perfectly sweet little angels. These will make a beautiful gift for our bible study ladies…next year.